Hi all….well it’s a chilly will morning here in Michigan. I’ve got plans to stay busy working and not thinking about being cold! I’m sharing the cards we are creating in class tomorrow. I let the girls vote…and they wanted to make Easter cards. 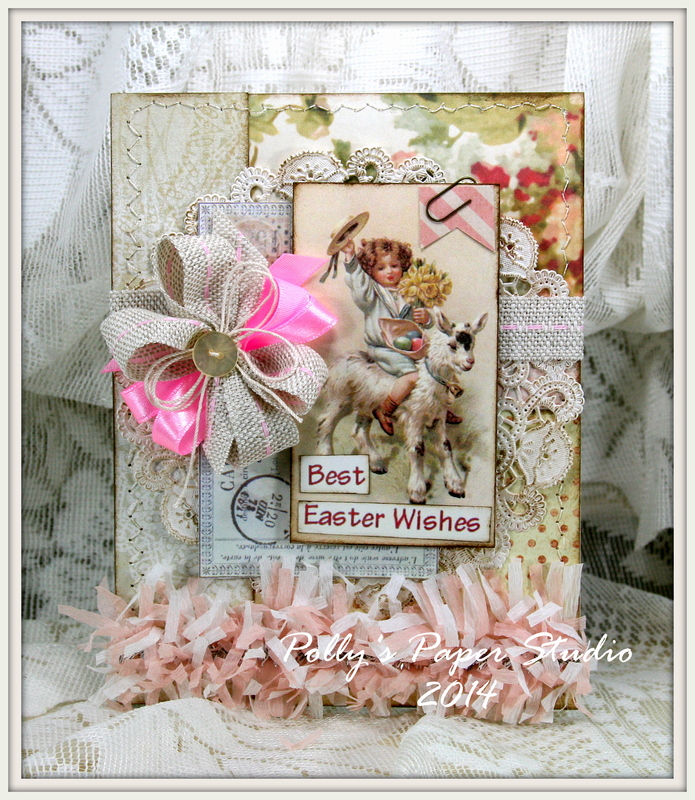 There are layers and layers of printed papers, vintage images, ribbon and lace, bows and flowers, clips and felties. 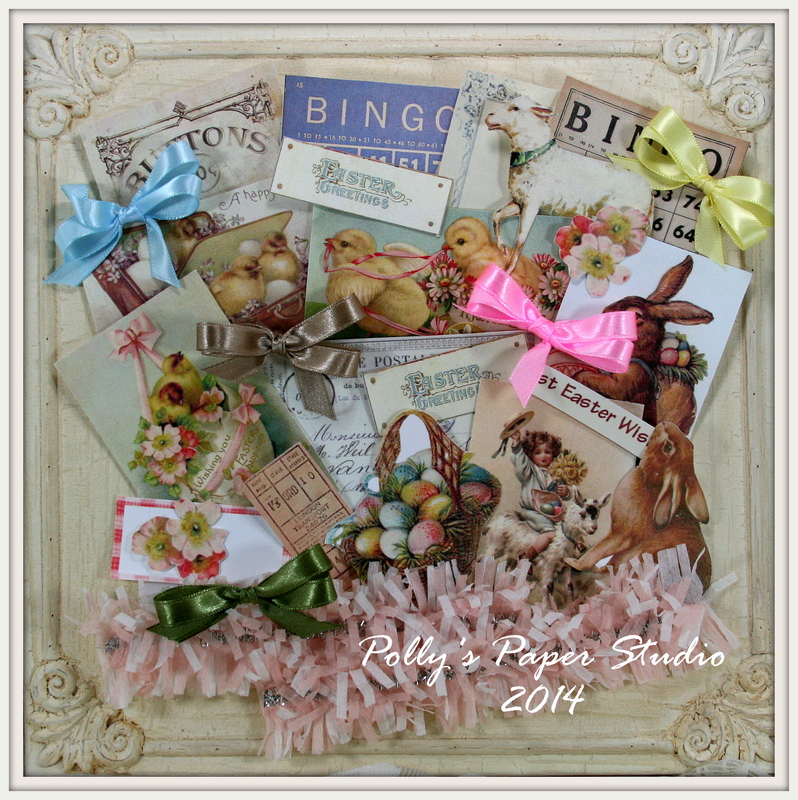 And lot’s of ribbons from Really Reasonable Ribbon. 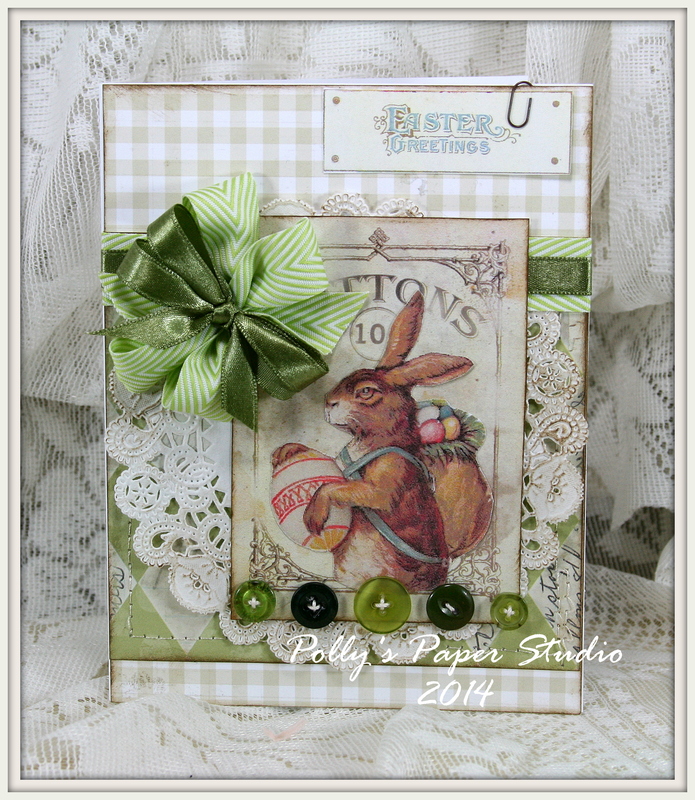 If you’d like to make the cards, but can’t come to the class….we have a select few kits available in the ETSY shop. 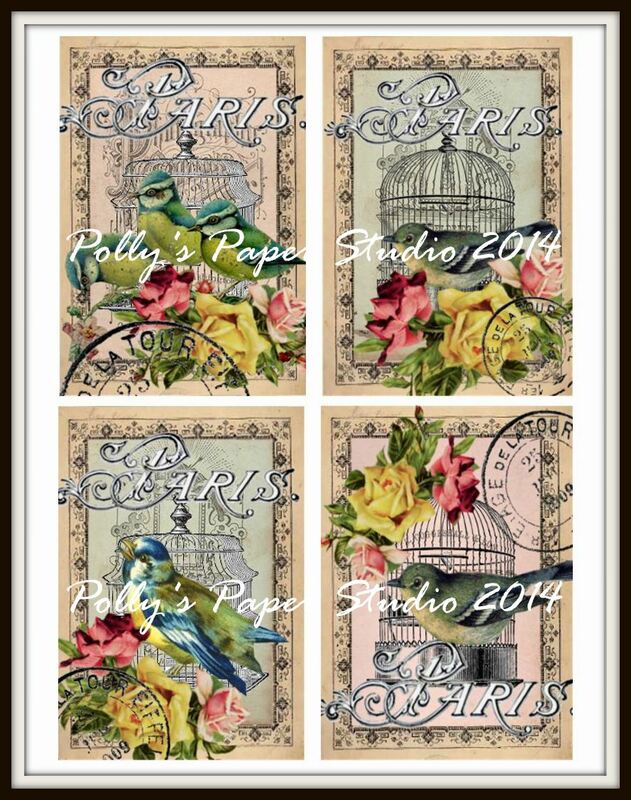 I’ve also added another digital collage Paris Bird Cages just right for spring. 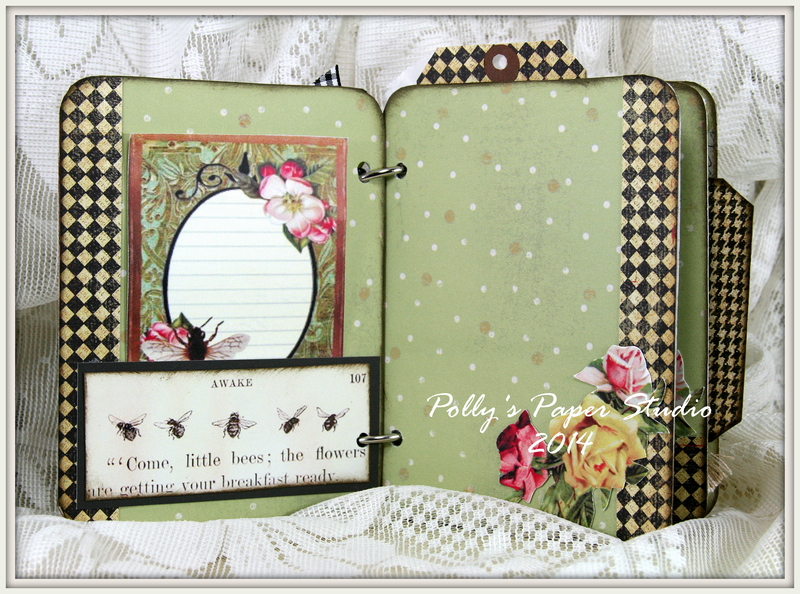 I think the images will make a beautiful cover for an art journal or smash book. 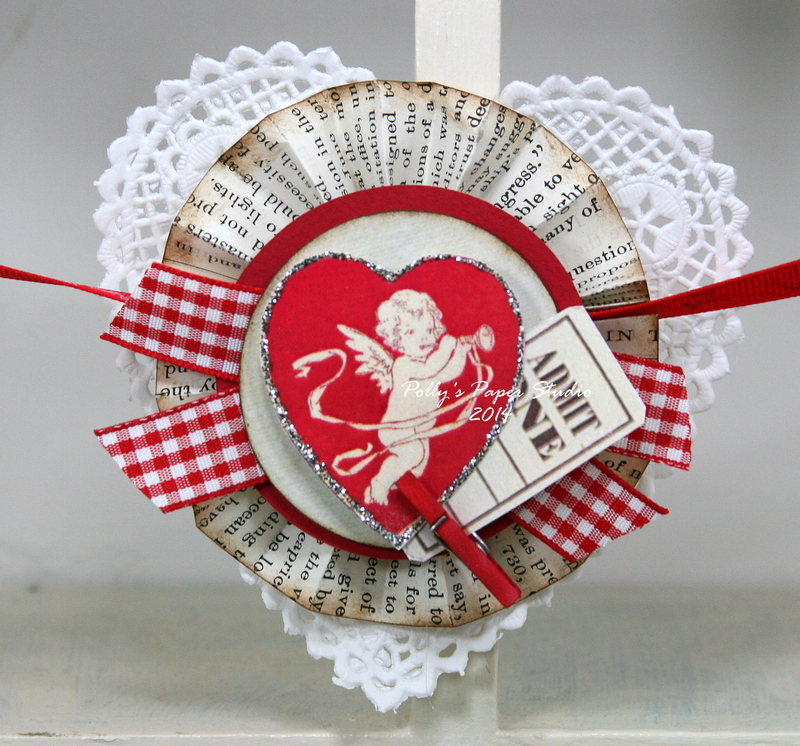 Hi all…it’s Ginny here to share a sweet little banner I created with lot’s of bit’s and pieces from my Valentine scrap and salvage box. This banner was so easy to make. The hardest part was getting my Cricut down from the top shelf lol. 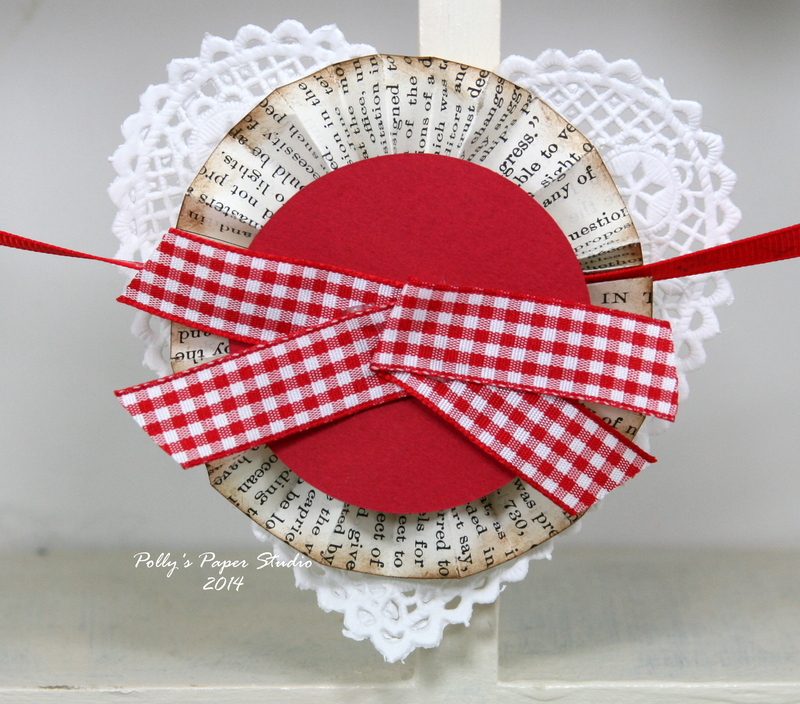 I started with Sweetheart Cherries Grosgrain Ribbon. 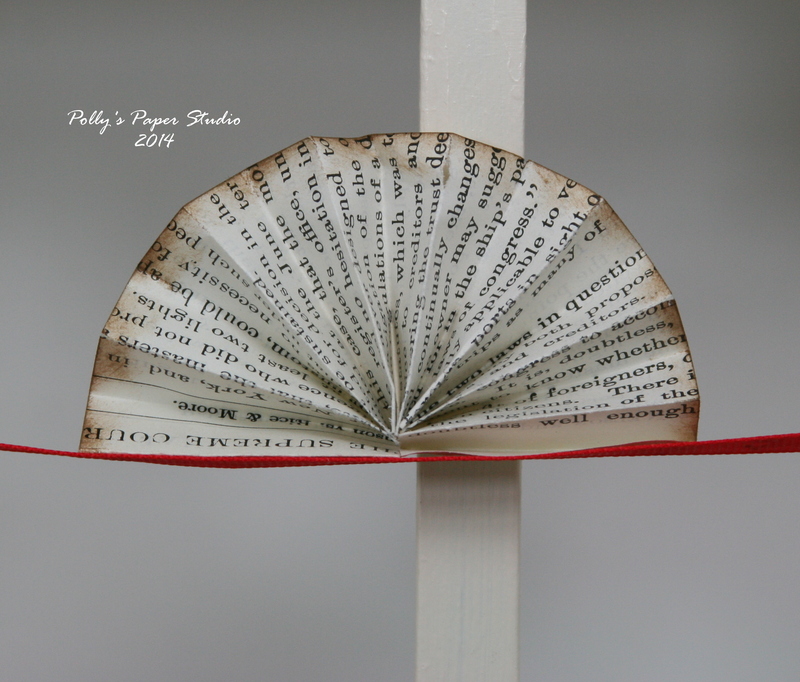 I used my Scor-Buddy to create these pleated 1 1/2 inch wide strips of book page. Walnut Distress ink gave the outside edge a nice detail. With hot glue I attached it to the flat side of the ribbon. Here is the other half on the bottom. Notice how it’s not even remotely straight???? lol…that’s how I roll with the glue gun. Pretty doily donated by friend Bobbie. 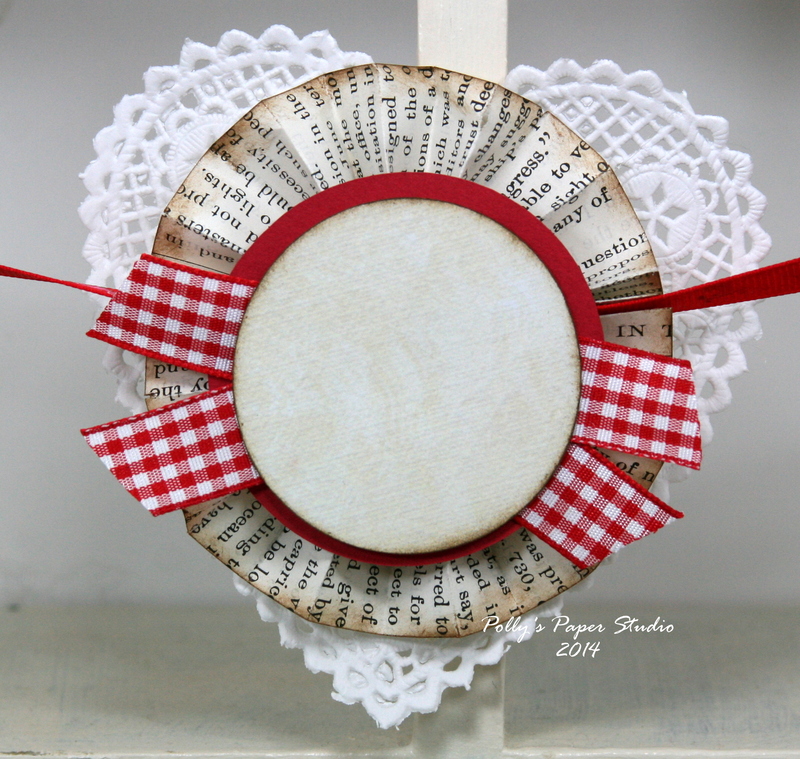 Add a red cardstock circle to the front. 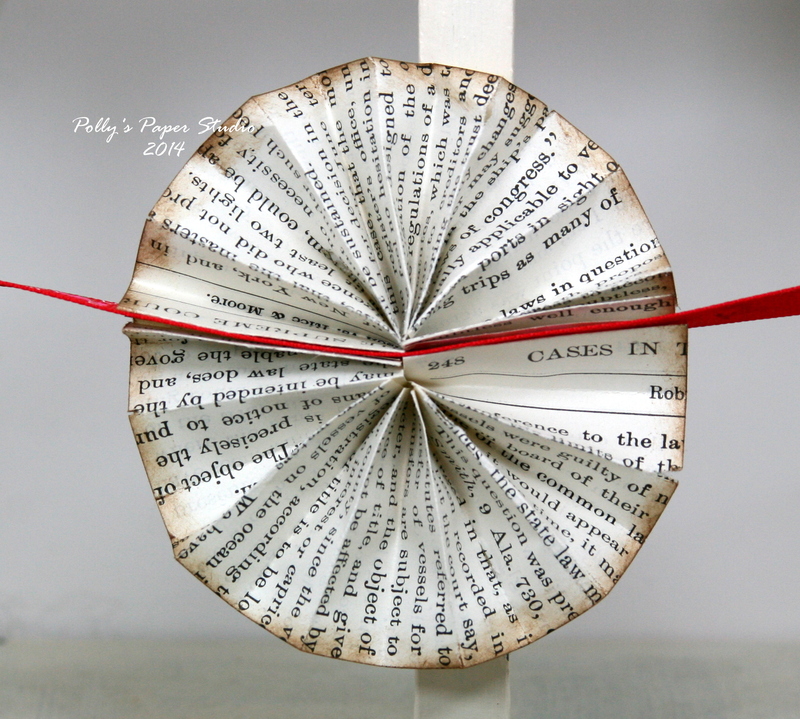 Now layer on two folded lengths of Red Plaid Ribbon. This circle if off white…I inked it also. 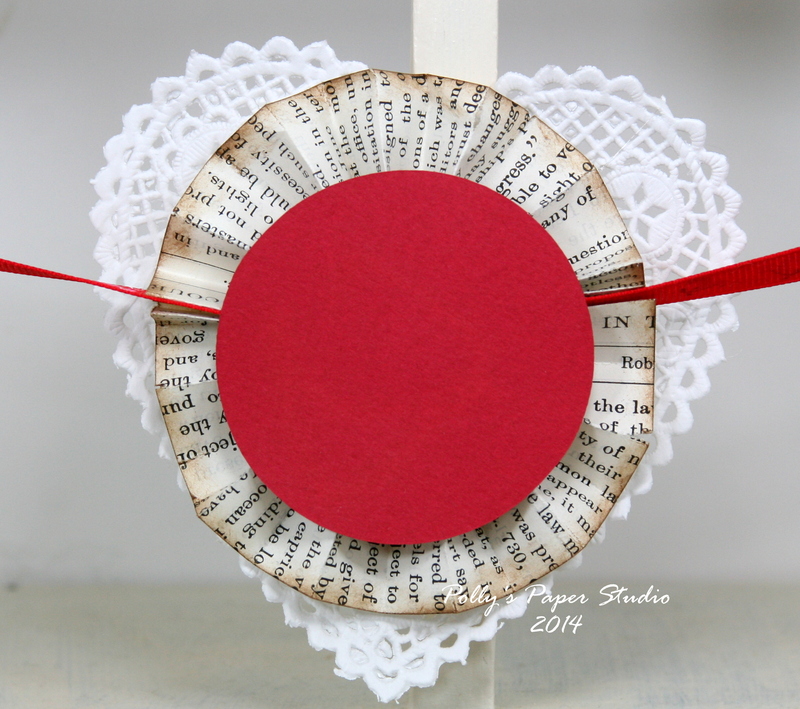 I finished off the center banner section with a sweet little glittered heart image with cherub, ticket, and tiny red clothespin. 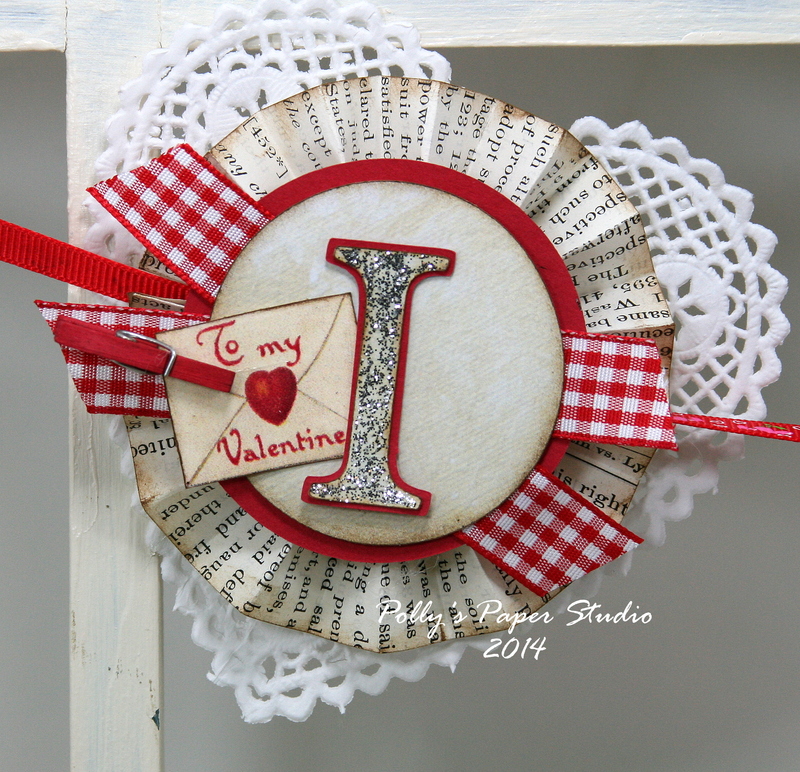 This side has a little love letter with clip and very glittery I. 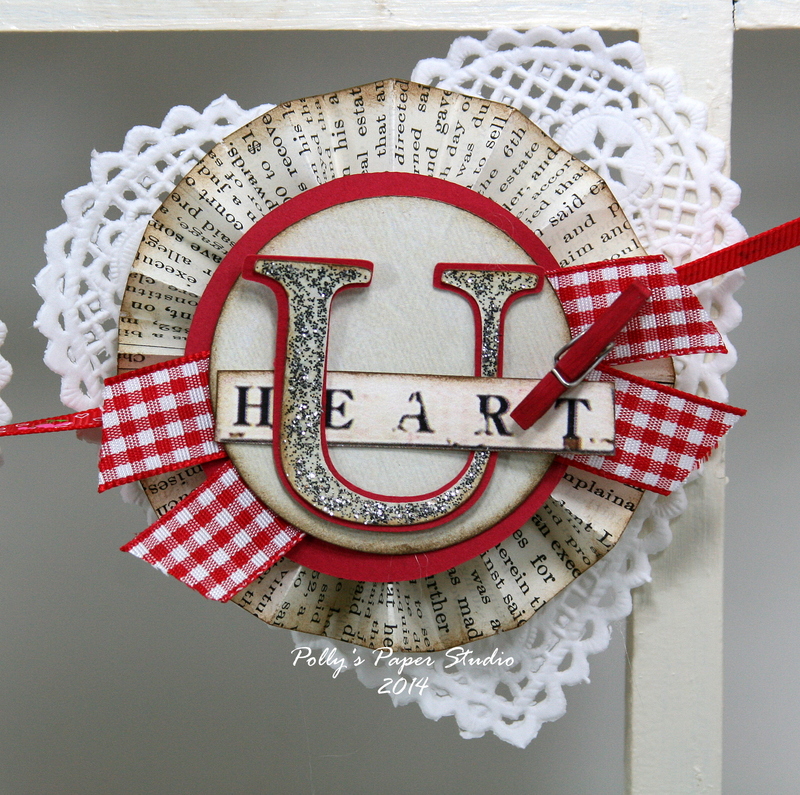 This little heart text block was just a bit too wide…so I threaded it through the U and added another clip. Chicks and bunnies and eggs and lamb. 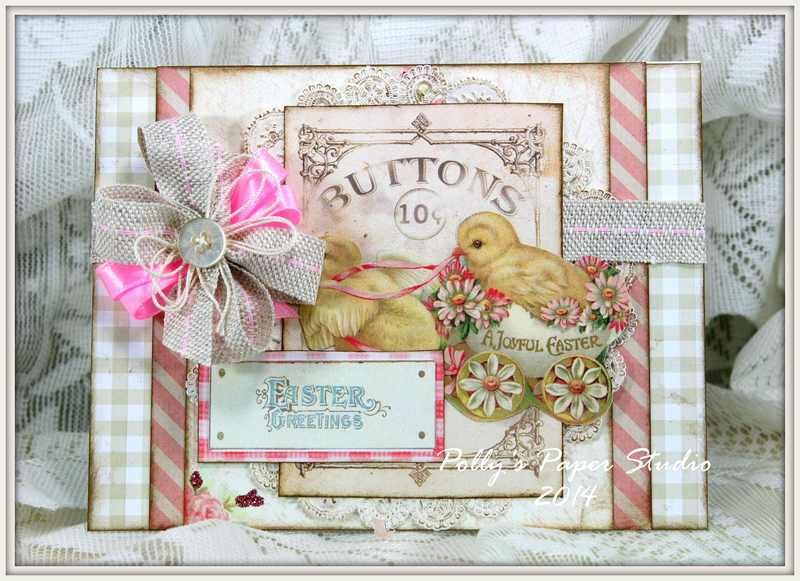 All in super sweet shabby pastely Easter colors. Hand crafted tinsel topped crepe fringe and pre-tied bows. 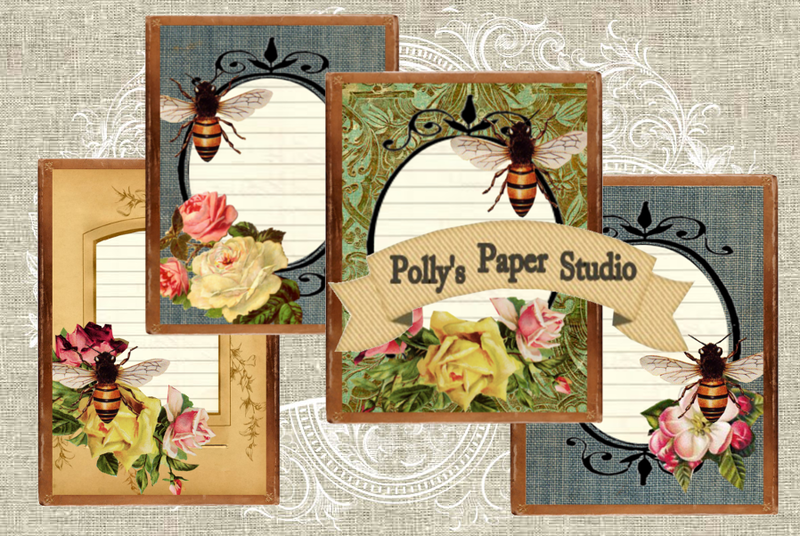 All images printed on 65 lb cardstock and trimmed so you’re ready to get your craft on with this fun kit. 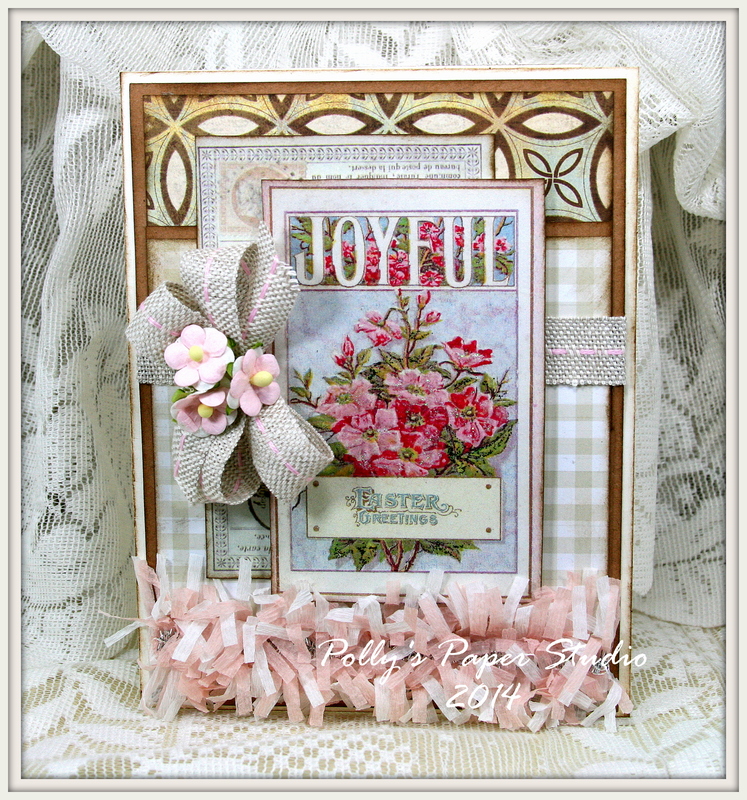 Additional trims used from Really Reasonable Ribbon: Burlap Center Stitch Pink, Chevron Striped Twill Celery. 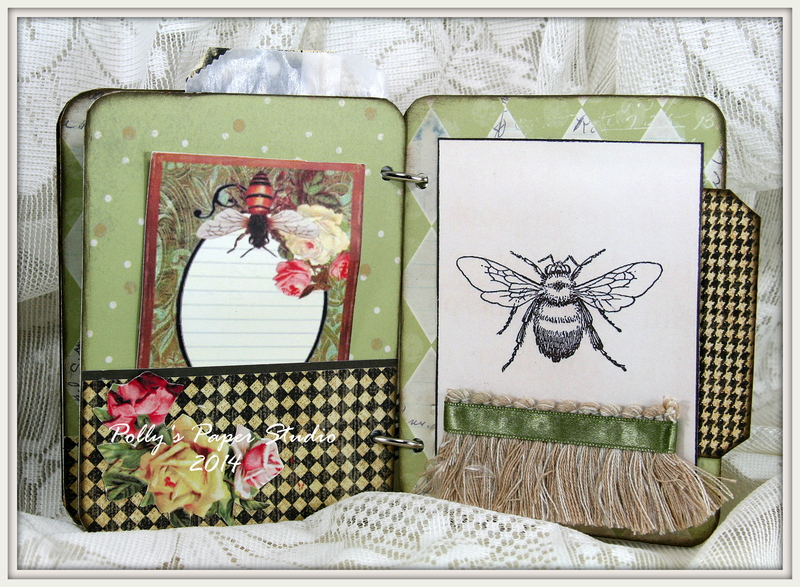 I couldn’t resist snagging the Bee and Bloom Collage Sheet and creating a little art journal. 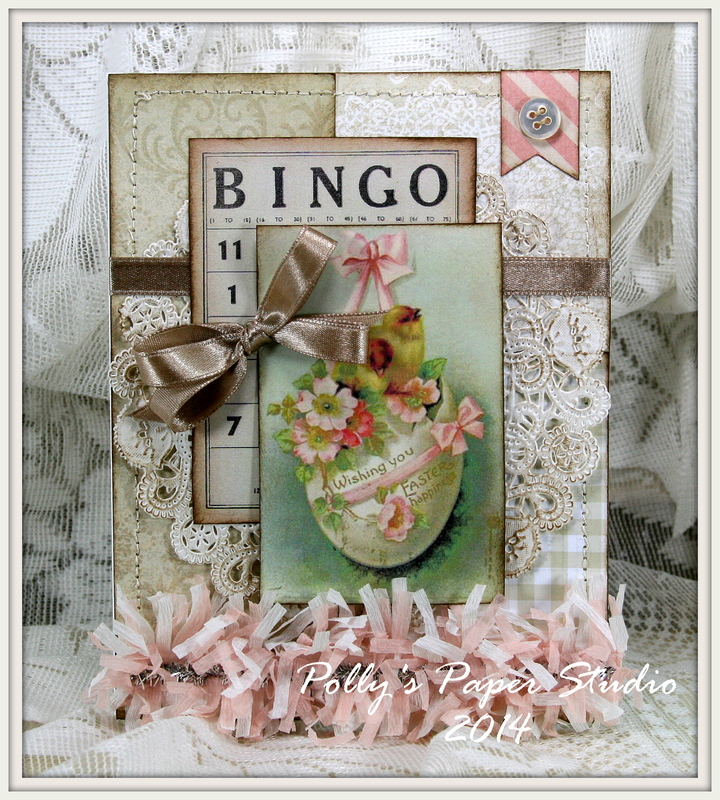 I was having lot’s of fun playing paper with my dear friend Bobbie on our chilly wintry Saturday at the shop and even got a nice visit from Anna, Tracy, and cuppycake ( Anna’s super beautiful Grand Daughter.) Such a nice day to spend with my Peeps! 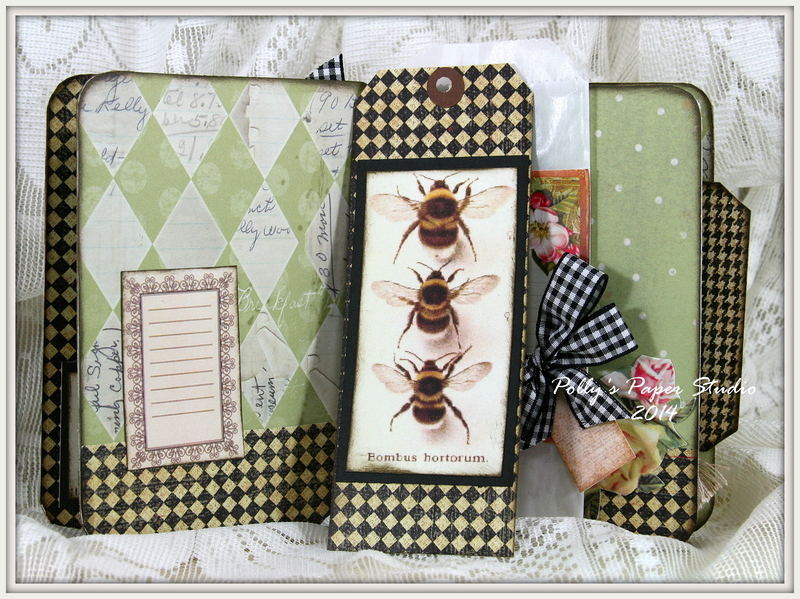 I used one of the journal cards to start the cover, then added some text blocks, buttons and loads of Stickles. 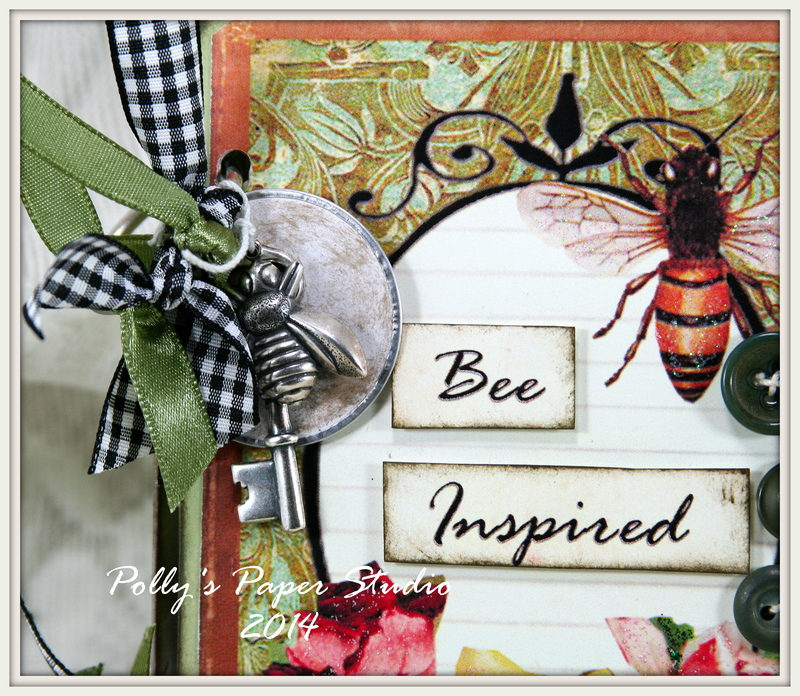 I had this great little bee charm in the stash so I added it to the binder ring along with a metal rimmed mailing tag and a key charm. I think they’re charming lol….see what I did there……charming. I crack myself up lol. 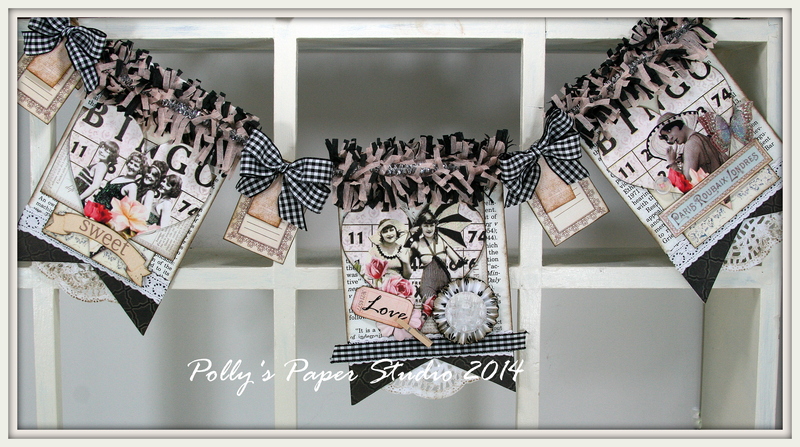 I added a very generous amount of Black Gingham ribbon from Really Reasonable Ribbon as well. 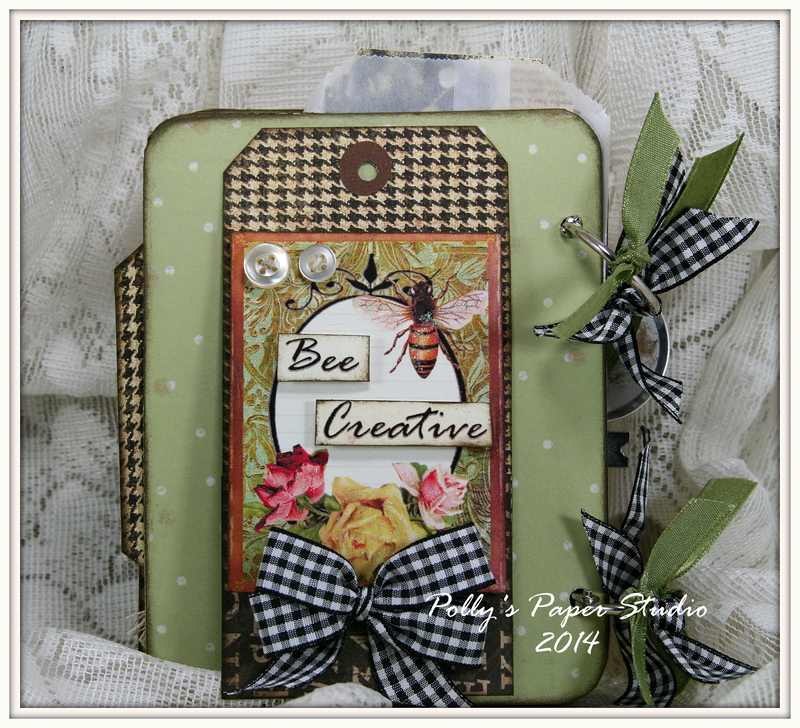 While I had all the paper pretties out I worked on an extra tag as well. 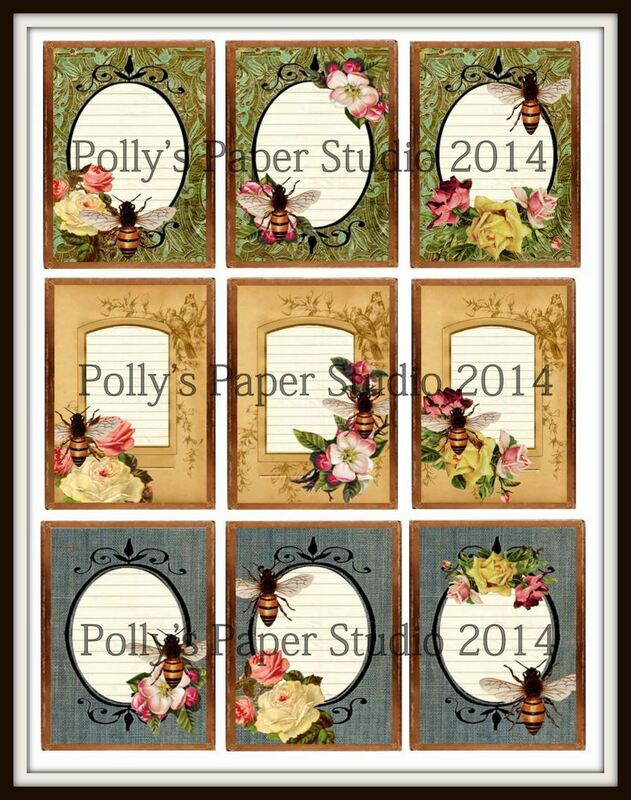 You can get the Bee and Bloom Collage sheet HERE. 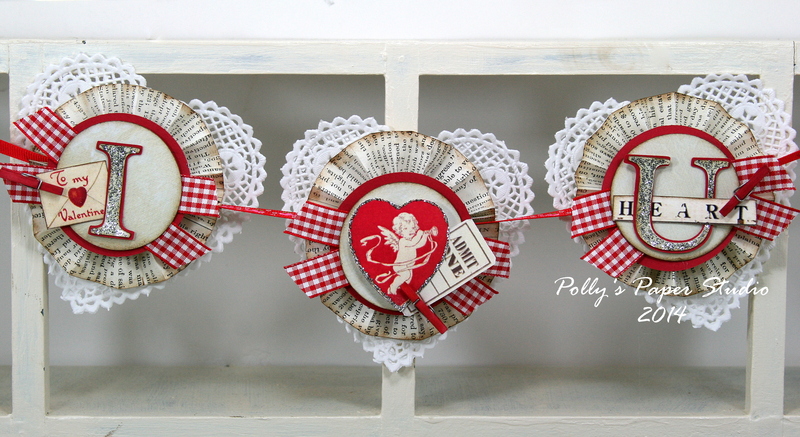 Our project for class this week is a super vintagy Valentine Banner. 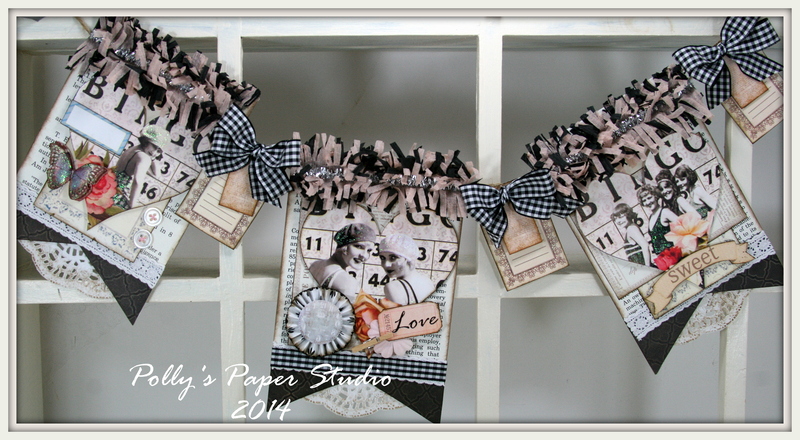 I have to say this is one of my absolute favorite banners I’ve created so far! 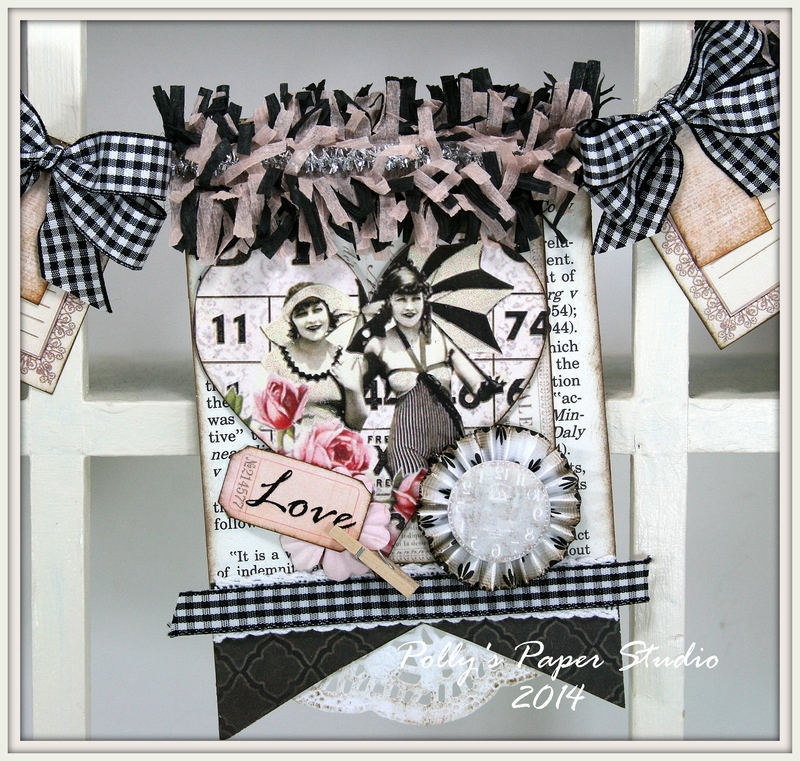 I started by creating a set of vintage bingo hearts with flapper girls and flowers image then added it to book page banner shapes, handcrafted by me tinsel topped crepe fringe, tags, paper rosettes, butterflies, tickets, tags, clothes pins, buttons, flowers and LOADS of supper chunky Really Reasonable Ribbon black gingham ribbon bows! I know we are going to have lot’s of fun with our wild and crazy group of girlies! Can’t wait for Tuesday night : ) If you can’t make the class but would still like to get a kit to make a banner for yourself there will be a small amount available in the Etsy shop. 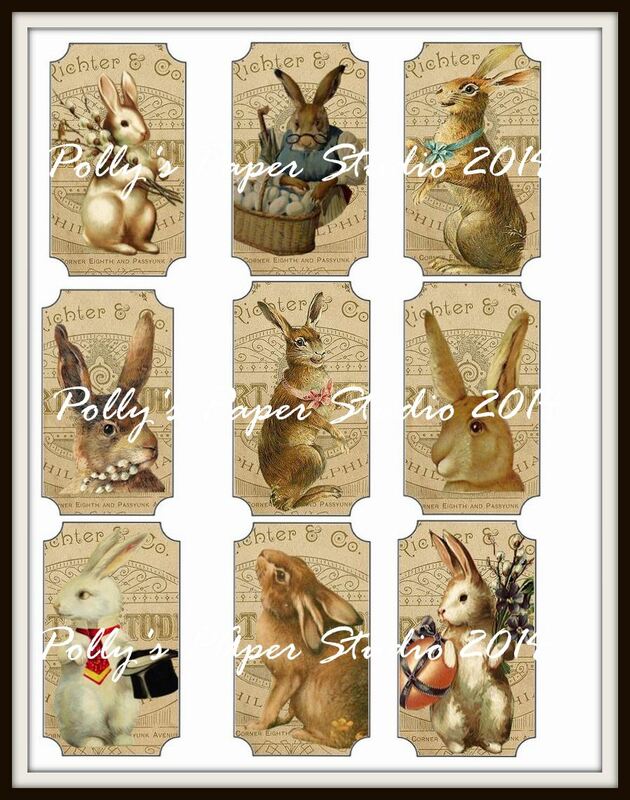 I’m adding a special offer for all those who order the kit from the Etsy shop…..I’ll be issuing a coupon code for every banner good for a free digital collage of your choice from our shop. 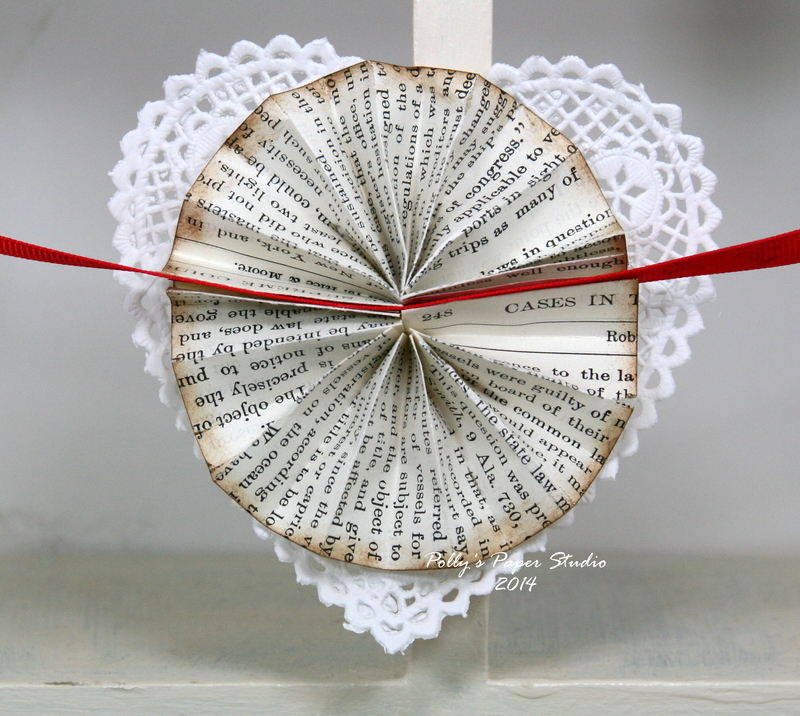 I’ve added quite a few new ones…so if you haven’t looked lately you’ll find lot’s of new ones to choose from. 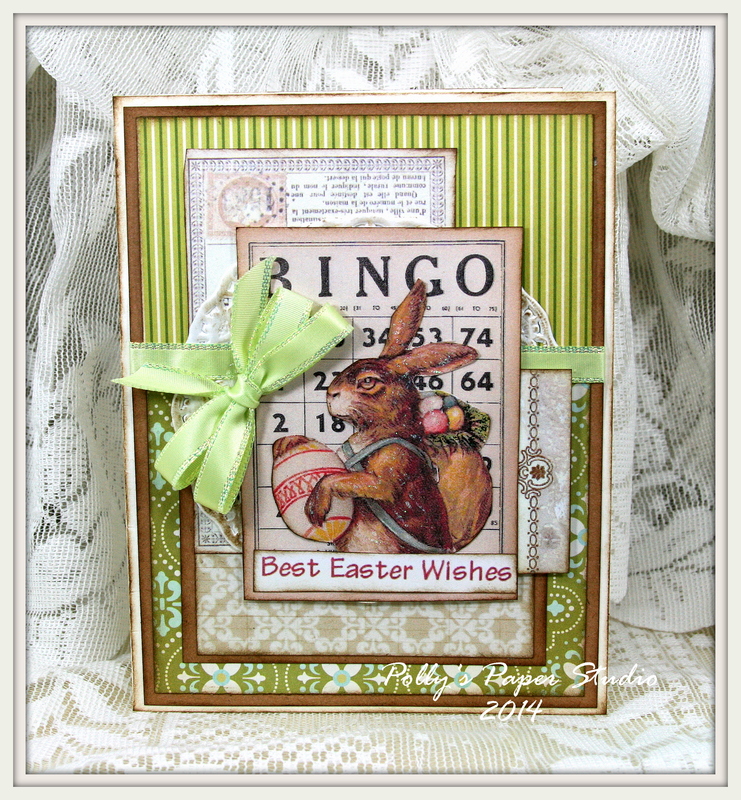 Easter Tickets, Bunny Tickets, and Easter Button Cards. 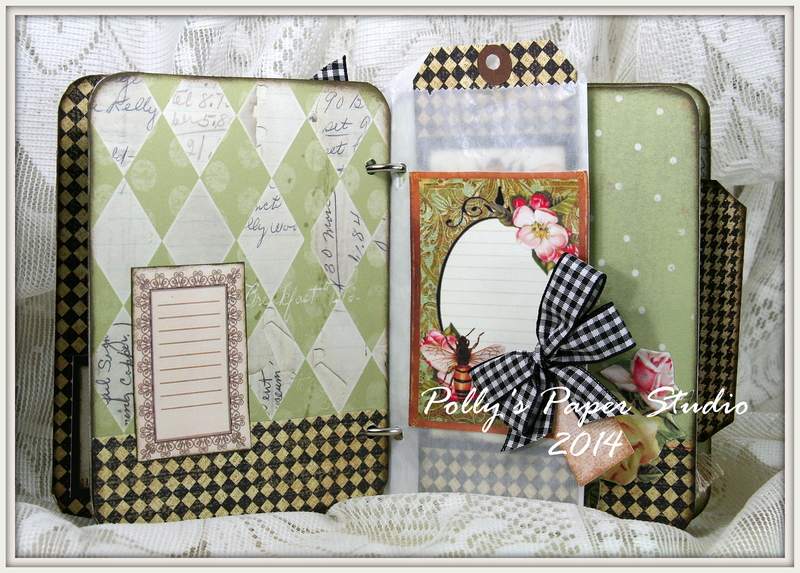 Hello Paper Peeps….I’m just popping in to share a lovely collage sheet I created this cold dark morning. 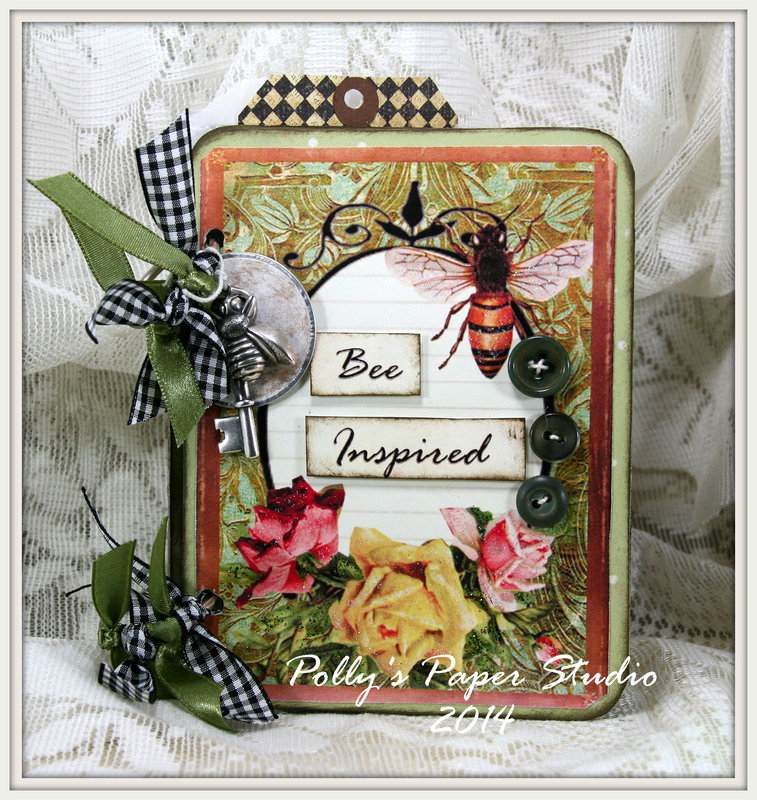 Hopefully working with Bee’s and flowers will get me into a summer state of mind. 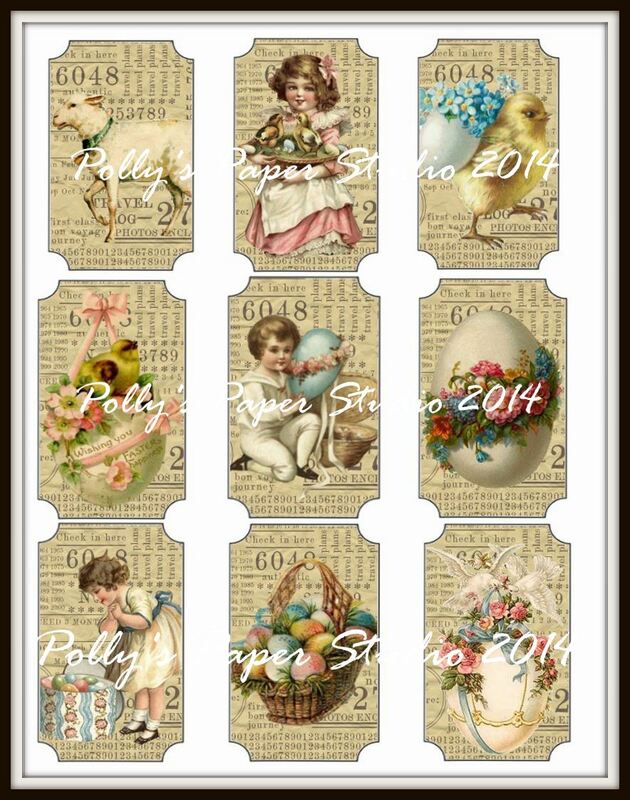 These cards would be great for journaling, card making, scrapbooking, tags, or strung together to create a banner.